All new homes are blank canvasses on which life can play out. Each beautiful pristine shell tells the story of those involved in its construction, and the vision of those who are set to call it home. However rarely does a new home feel like it has always been. For Peter and Rose Townsend their new build offers exactly that. Warm and inviting, there is no doubt this home has been built for enjoyment and living. Sitting at the kitchen bench listening to Rose and Peter relive their build, it is apparent that the journey was anything but effortless – ‘enjoyable and exciting’ yes, but one that took over two years to complete. 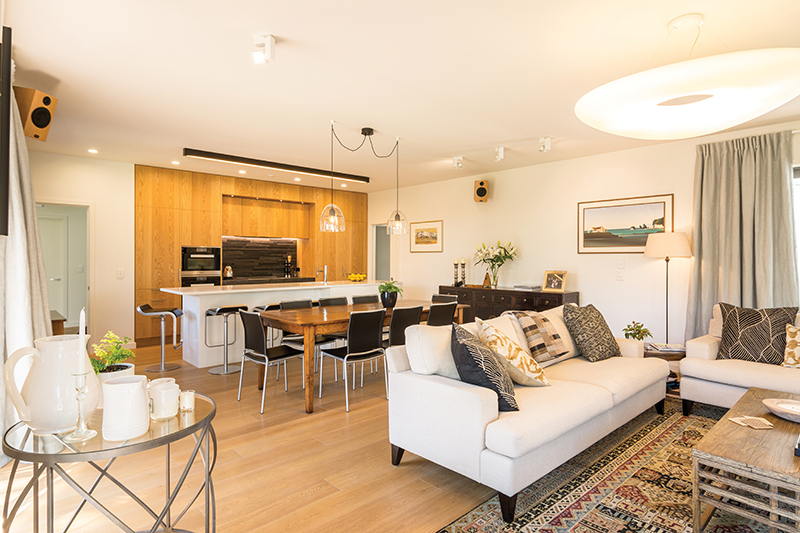 With their family home badly damaged in the Canterbury Earthquakes and their children having flown the nest, the couple made the decision to subdivide their section and build two High Performance Houses. ‘The intention was to downsize and build a more manageable home and section for us to enjoy’, explains Peter. The decision saw the couple embark on two builds simultaneously. ‘We built both on the basis that we could live in either’, continues Peter, ‘and we currently call the back house home’. Seeking inspiration for their build, the couple visited the HIVE village, once located at the Canterbury Agriculture Park, and discovered a High Performance House designed by architect Anne Salmond of Salmond Architecture and built by Dan Saunders Construction. Clad in vertical cedar and embracing a simple pavilion form, while being efficient in terms of both layout and energy, it instantly appealed. ‘It made sense to us to be building energy-efficient homes, designed for easy living’, explains Rose. Despite their proximity, the two houses work beautifully together and offer occupants of either, complete privacy. ‘They aren’t identical but do have a family resemblance’, laughs Anne. Before construction could begin on either house, however, there was the small problem of the broken brick home that had once stood pride of place on this beautiful section. ‘I love a challenge’, enthuses builder Dan Saunders, ‘and that was what this was. ‘It is our aim to make a difference within the building industry’, explains Dan. ‘No matter what the budget, we ensure we are going above and beyond the minimum standard [the building code] to build better homes.’ From the inside out, Dan and his team build more than just beautiful spaces, which is particularly evident in the Townsends’ home. Passionate about ‘not being ordinary’, this project is a showcase of builder, Dan Saunders, and his dedication to quality and to his clients. Rose and Peter lived in the front part of the old house while the back section was cleared, the garage demolished and the pool removed – making way for what would be their new home. ‘We had about 1.8 metres of space to work with, between the new house and the old’, explains Dan. ‘Once the back house had been completed, we moved in there, while the rest of the old house was demolished, the downstairs bedroom [of the back house] constructed, and the front house built’, continues Rose. For CGW Consulting Engineers, the rebuild wasn’t as straightforward as simply knocking down the old house and rebuilding twice over. Partially built over the old swimming pool, the site for the rear house had to undergo a geotechnical and structural inspection before being fully excavated, by Digout Services, and backfilled in compacted gravel layers to provide a firm foundation for the floor slab. ‘The expectation is that this house will be resilient in the face of another earthquake sequence’, explains Engineering Manager Damien McGill. ‘Most of the damage in Christchurch was caused by foundations not being able to cope with the differential ground settlement. Here, the ground and foundations have been improved as part of the design and construction process.’ Substantial digout and backfill was then required for the front section to ensure that the build was constructed on firm ground. However it isn’t only the incredible demolition and construction processes that make this home worthy of note, but its performance. For both Dan and Anne, building homes that embrace energy efficiencies is a ‘no brainer’. ‘Wherever we can, we educate people about how easy it is to embrace an energy-efficient home’, explains Dan – ‘tailoring solutions to budgets and designs’. ‘People are becoming more aware of energy efficiencies’, adds Anne, who has built a reputation across New Zealand for her dedication to designing healthier, more comfortable living environments. ‘We need to be placing greater importance on energy efficiencies and high-performance homes’, she continues – ‘as, ultimately, they equate to better health and comfort, as well as greater savings’. Playing an elemental role in creating this thermal envelope was Graeme Baker and his team from Absolute Energy, who supplied and installed a multilayer warm-frame polyester insulation system, from the floor slab up. ‘Out of sight is not out of mind when it comes to achieving a quality insulation outcome’, explains Graeme. ‘Too often gaps, and even holes, exist in traditional insulation installs. Here, the multilayer system eliminates weak points in the thermal envelope. ‘We used a similar system to that of the HIVE house, which, when undertaking thermal imaging, showed no thermal weak points attributable to the steel frame of the home – the insulation system is that effective. Inside, the home boasts a crisp, beautiful interior. Lance Ash Interior Plasterers fixed and stopped the plasterboard walls throughout the home, achieving a finish that does justice to this outstanding home. The experienced plasterers provide a complete drywall service, and take pride in the meticulous care they take to achieve a flawless result. Their work paved the way for the team from Gerald Diver Painter & Decorator. Described as an umber white, the interior has been completed in Resene Wan White, which offers a warm and soft interior palette. ‘Many of the things that we love about the kitchen, that make it easier to live in, are touches that she introduced us too’, shares Peter, pointing out the LED lighting in the drinks cupboard, the soft-close technology and the corner cupboard solutions. Working alongside architect Anne Salmond to tweak the plans to ensure optimal use of space and storage, Ingrid and her team have achieved a functional design that perfectly integrates with the architecture. ‘Rose and Peter wanted a home they could feel comfortable in – not flashy or opulent, but beautifully detailed and sophisticated – which is what has been achieved’, shares Ingrid. Crafting the ‘beautifully finished joinery’ was bespoke kitchen manufacturer, Lyall Park Joinery. The combination of the Crown Cut Oak veneer cabinetry with the suede steel grey Granite bench gives depth and natural warmth to the interior, while the Caesarstone Ice Snow bench seamlessly connects it with the living area. Achieving this same timeless finish on the floor throughout the rest of the home was Nextdore. Stretching throughout the ground level – the entranceway, kitchen, dining and living area – is premium grade European Oak. In colour Isanti, the 15mm wooden panelling achieves the desired warm aesthetic while also ticking the boxes for functionality. 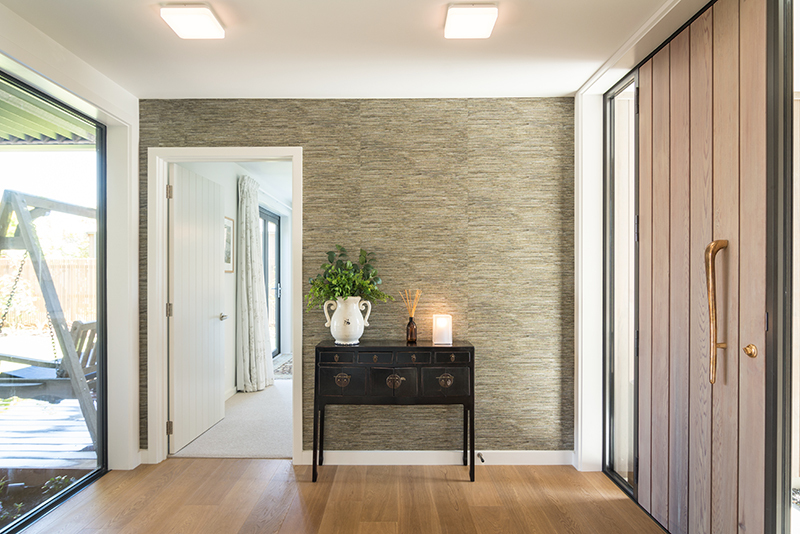 For the home’s three bedrooms, two of which are found on the upper level, The Hamptons, a luxurious Cavalier Bremworth 100% wool carpet in colour Montauk was used. ‘The house has been designed for easy living’, continues Peter. ‘And is incredibly efficient in its use of space.’ Spread across two levels, the home is only 240sqm yet feels incredibly open and spacious – a feat achieved by integrated indoor-outdoor living. While on the upper level a balcony offers a private and sheltered space in which to hide away, the living and kitchen area on the ground floor is framed by expansive ranch sliders and floor-to-ceiling windows. Opening the ranch sliders, and the garden and deck are cleverly-designed extensions of the internal living spaces. Taking cues from Scandinavian-influenced architecture, landscape architect Ben McMaster ensured his design was an ‘appropriate and compassionate addition’ to the property. ‘Strong lines have been used to create an illusion of space’, shares Ben, ‘while also working to achieve spaces that are practical to use and maintain. Like the home, a simple palette plays to the strength of impact through simplicity. ‘It was really exciting to be working with clients who were open to and excited by the idea of using different materials, and who were happy to trust us’, he continues. With the property surrounded by large established trees, it was a fine balancing act between keeping proportion to the entry path and driveway, while maintaining the health of the trees. The addition of a lightweight fence system, to minimise root disturbance, and a gravel chip driveway offered the solution. Stylised yet timeless, the landscaping unites the home with its surrounds and provides multiple spaces that the couple and beloved family dog Elsie can enjoy. Opening off the outdoor living area, a lawn area provides scope for play, while concrete stepping stones lead down the side of the house to the spa and vegetable gardens. Offering added versatility to the outdoor living area is the addition of a Silencio and Concertina Louvre system from Johnson & Couzins. At the touch of a button, the motorised aluminium louvres rotate 180 degrees – allowing you to catch the sun, shield the wind or create shade – before closing for privacy and rain protection. The Concertina retractable roof control then allows Rose and Peter to extend this offering further, with the louvre fins sliding back to expose the open sky. Part of what makes this project such a beautiful solution is the cedar-clad exterior. ‘It is a very simple material’, describes Anne, ‘yet one that has a familiar sense to it and adds character to the simple form’. Enhancing the exterior lines is the Hiland Tray concealed fix tray roofing from Stratco Roofing. With an innovative concealed fixing system, the Hiland Tray snap-locks to a clip, fixed to the roof purlins: from the upper level of either property, the architectural roofing profile offers a smooth and uncluttered aesthetic, in perfect harmony with Anne’s pavilion design. A quad gutter and concept fascia, also supplied and installed by Stratco Roofing, completes the exterior. For Peter and Rose the journey to creating their new home has been a long one. As the Chief Executive of the Canterbury Employers’ Chamber of Commerce, Peter has certainly had more than his fair share to deal with, manage and rebuild over the last six years. Yet his positivity and unwavering dedication to seeing the best in every situation has ensured his family home has a bright future. As Anne notes, the optimism and resolve behind their new home is precisely what Peter says is needed for Christchurch. ‘The pair have built something sustainable, which is designed for the future - something positive out of something disastrous’.